Sterling Teal, Inc. has been producing quality manufactured automotive air fresheners since 1993. Products feature “eye catching” packaging” and “cosmetic grade fragrances” that continue to drive success. Sterling Teal offers unique and traditional air fresheners to the automotive aftermarket. 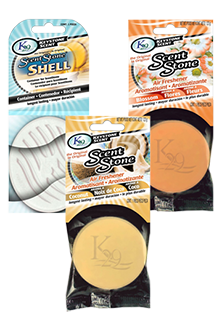 The K29 Scent Stones are long lasting and perfect for the out of sight air fresheners. We have a large variety of fragrances and offer the lowest prices in the nation GUARANTEED!! !